Welcome to our discussion! This is where you can talk with other students about Gateways you've read. Let the conversations begin! There are two main character's Citra and Rowan. Citra is the first character we see it starts off with a scythe showing up to her door. he ask's to come in and eat with. Citra has kind of a mental break down and faces a conflict in her head on who might be gleaned is it her mom her dad her brother or her. she ends up yelling at the scythe asking who he is gonna kill. even tho she is smart sometimes Cirta acts stupid. The next character is Rowan him his best friend is a splatter him and his friend feel like they are unnoticed by there families. Rowan comes into conflict at school when he was walking in the hall way and encounters a scythe he had to choose to help him or run from him. he helped and the scythe when a kid got called to the office a Rowan stood with him and even held his hand when the scythe shocked him. this shows that Rowan is a good kid who will stand with people and try to help them. One of the main characters in Scythe is citra. The book starts out with a Scythe showing up at citra’s door and her mother lets him in and Citra is frozen because the scythes are the ones who kill people to keep the population from outgrowing. Then she outright asks the scythe his real age and why he is here, and who is he going to glean and to just get it over with. She is very bold with her choice of words in the presents of a scythe. Even though the he could kill her whenever he wanted to she didn’t care just wanted it over with. While I do agree with your blog I find it to lack variation in telling me about Scythe. I would advise you to not only add more about the book, but to re-read what you write so that you can communicate your points and make it easier to understand. First off it is important that you add some info about the second character Rowan and how he plays a part in the beginning of the book. Lastly make sure you are looking at the big picture when trying to explain the conflict, not just the problems that Citra is having in a single part of the book. The book Scythe starts off in a futuristic version of society where no one can die do to instant revival, and accidents and problems don’t exist.The only way to fight overpopulation with the new technology is to have executioners called “Scythes”. The Scythes are basically the Reapers of society, but instead of being a dark force they are more like a feared royalty. The two main characters in Scythe are Citra and Rowan. At this point Citra is a hot tempered girl apart of a decent family, and Rowan is friends with a “Splatter” (A person who jumps off of buildings for the rush and gets revived multiple times). Rowan and his friend Tyger feel like they are forgotten within their families, and that they don’t mean little or even anything to anyone. The main conflict is that both Citra and Rowan have had to deal with the fear and tribulation of Scythes and it is hinted that there recent run in with the deadly Scythes will lead to some interesting events in the future. The main characters Rowan and Citra are met by the scythe Faraday at the oprah. They both are confused by the sudden talk by a scythe but i think he brought them here because they weren’t scared of him when he told them what he was here to do. With Citra her mom made the scythe dinner and they had a talk where the scythe told her he was killing her neighbor Citra is a young girl who lives with her brother and parents. Rowan is a adrenaline junky who likes having the rush of dying over and over. With rowan, Rowan stayed with the scythe as he killed the janitor and Faraday told him he was the only one who was proud of him, after that people at the school started to get angry at Rowan and make up things about Faraday being Rowans uncle so Rowan finally snaps and uses his wits to get everyone to stop messing with him by saying that Faraday is his uncle and that he will kill them all. I think that Faraday wants both rowan and citra to be future scythes but not bad scythes who abuse power. In my book there are two main characters I have only read a little past the first character Citra so i'm going to talk about her. Citra was eating with her family when a scythe named Faraday appeared in her house and the family though the scythe was there to kill one of them but he was only going for there nabor and the scythe said that she sould become a scythe because she has the requirement of not wanting to be a scythe and i'm pretty sure Citra is nice, caring to others and values her family. I like your comment but you should have put more information about Citra herself before diving into the main conflict. Other than that this is a good comment. In the book “scythe” there are two main characters Rowan and Citra. In the first part of the book a scythe shows up at Citra’s house. She is frghtened by the scythe and thinks that he will kill someone in her house. Citra then finds out that he is there to eat dinner with her. Citra is very smart. The other main character is Rowan. When Rowan was in school he saw a scythe and decided to help him. Rowan is a very kind person. The main conflict is that both characters had to deal with the scythes which will lead to future events. I like your comment because you explain the smarts of the main charterers the conflict with the scythe. Also some advice you had summarized the start of the book and you could have just talked about the emotions of Citra and Rowan. There are some important parts that happen in the start of the story like how both Rowan and Citra encounter a scythe. They both also say they will never become scythe's. I think these are both important because it adds onto the story. Rowan both kinda stood up to the scythe. With Rowan he stayed with the janitor. With Citra she was brave to ask the scythe questions. Citra and Rowan are teenagers who have been chosen to be scythe’s apprentices, and despite wanting nothing to do with the vocation they must learn the art of killing and come to understand the necessity of what they do.Only one of them will be chosen as a scythe’s apprentice. And when it becomes clear that the winning apprentice’s first mission will be to glean the loser, Citra and Rowan are fighting against one another in a fight for their lives. Your comment is good but you should talk more about the main characters and how the people in the book think about them before talking about the conflict. “Scythe” has become more and more interesting. Just as I had thought both Citra and Rowen have been inducted as apprentices of Scythe Faraday. They both seem to hate their new positions, but it seems to be slowly growing on the both of them. I predict that as time goes on and Citra and Rowen’s relationship becomes more competitive they will become more okay with being trained in the art of the kill. Do to the way they think it will be hard for them to transition, but when the time comes for the both of them they will make amazing scythes, just as Scythe Faraday had said. In the book “Scythe” I made a prediction when Citra was invited to an opera randomly by an invitation with no signature or return. Since Cirta had been brave and did not want to be a Scythe in any way. I came to a predictions that she had been invited by Scythe Faraday to be trained to become a apprentice of him. In the next few pages it reads that she and one other boy had been chosen to train and then fight to death to get the role of being a Scythe. In the book “scythe” i predict that that Rowan will become a scythe. Rowan is more skilled and is very brave. He is strong minded enough to become a scythe, and has the skills to do the job a scythe does. Citra is smart, but she is not as strong as Rowan. I do not think that Citra would have the mental strength to “glean” someone, but she has the skills to glean someone. Rowan has not became a scythe yet though. Rowan might have more physical strength but Citra has more mental capacity and has more knowledg3`e in the gleaming arts, with this i believe that citra would win the ring. I predict that in the book scythe, the last challenge will be that Citra and Rowan will have to gleam each other. They will have to overcome friendship and kill the prson who they have spent the last 12 months with. It would be the ultimate lesson on gleaming because it would show that they have to do things they really don’t want to. I think this because it would be a twist no one expects and i think the author wants that. I do like your theory because it is such a sinister twist. However Scythe Faraday is very honest and precise with his words, and he specifically said that the one who didn’t get the ring will go home. So while this theory would put an amazing twist on the book I don’t think it will happen judging by past events. Scythe Faraday has never lied or cheated the system, so when he goes about saying that the loser will get there normal lives back, I believe him to be honest in that regard. I agree with your prediction and i think it is highly likely to happen. I can see that Citra and Rowen are getting more and more competitive as the books continues. Citra is becoming more confident and is likely to get her job done when she needs to. In the book Scythe they have two main characters Citra and Rowan and the main subject is they met a scythe named Faraday that offered then both the chance to be a scythe which gives them immunity but neither of them want to become one . I predict That Citra one of the main characters will have a internal conflict with her self about becoming a scythe even though she knows that she has no choose. Scythe” has become more and more interesting. Just as I had thought both Citra and Rowen have been inducted as apprentices of Scythe Faraday. They both seem to hate their new positions, but it seems to be slowly growing on the both of them. I predict that as time goes on and Citra and Rowen’s relationship becomes more competitive they will become more okay with being trained in the art of the kill. Do to the way they think it will be hard for them to transition, but when the time comes for the both of them they will make amazing scythes, just as Scythe Faraday had said. Good Predictions, as you read you will notice that they will become more and more competitive i'm on page 130 so i know that this has become more than just a competition. these people want to win because they don't want to die. "scythe" has had a few interesting twist in it when the scythe and citra go to the house to glean the man. After he resisted i predicted that he would glean the rest of the family to punish the man for resisting death. my prediction was wrong. instead his family was given immunity from gleanings for a year and they were allowed to kiss his ring. The reason he did this is because citra help take the man down but she was not supposed to do that. I agree with your comment i didn't expect that Faraday would give the family of the man that came to gleam immunity for a year. I thought Faraday was a perfectionist scythe but he seems to have a soft side too. I agree with your comment because the "interesting twists" were unexpected to me. I never would've thought that Faraday had a nicer side of him. I thought he would always stay on his "evil" side. So far, I predicted that Rowan and Citra would be assisting Faraday in being scythes. The problem is is that they both don't like their new positions. Another problem with this is that they're going to have to be more competitive in their lives, which most likely would be a problem to Citra because she doesn't really seem like she's very competitive. Gleaning will a BIG challenge for the two because killing people isn't something that someone wouldn't want to do in their everyday life. This will most likely be the biggest challenges of their lives. This comment is good, but i think that Citra is a very competitive person and would have no problem gleaning someone. I think that they are both very competitive, but Citra is more competitive than Rowan in my opinion. I predict that Citra and Rowen will have to face some difficult challenges that they would of never wanted to deal with. Decisions that would make them contemplate even continuing to be a scythe. I predict that one of those challenges will be that Citra and Rowen have to either gleam eachother or gleam one of their loved ones. This would be a huge challenge for them because Citra and Rowen have been friends for a long time and started being scythes together. I agree with your prediction, because Scythe Faraday is only trying to recruit one person and wants to see who would be the better choice. To make this decision he might have them fight each other for the role. I also had predicted this in my blog. I also had this prediction were the winner would have to glean the loser this will be hard because they like one another and have known for awhile now this is a good prediction that is likely to come true. I agree with your prediction, because in order to be a scythe you have to be able to overcome things/challenges and having to glean one or the other or a loved one shows that you can overcome that fear and love to do what is necessary, which means being able to glean people that you've known/know without getting caught up in the grief. That's why I agree with your prediction. One part in Scythe that made me visualize something was when a couple scythes were going to glean people on a plane or something. When this part came around, I visualized a plane full of people freaking out while there were Scythes in different colored robes thinking about the people they should be gleaning. I also visualized people not knowing what to do other than going to the solution of jumping out of the plane knowing they might get gleaned. This scene was very dramatic. It showed how hard it is to choose to take someone’s life and how hard the life of a scythe is. 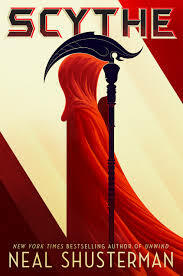 wazz up my homeies this is jdog407 back at it again i have read to page 176 in the book SCYTHE. woof woof this book shows characteristics of anger in rowan about how he has to kill that one chick named citra. JDog407 i 1Up you in every way. When Honorable Scythe Curie makes connections between the mortal age, and the world she lives in, it gives me a better understanding of the outlandish ways life has changed under the Thunderhead. For instance when H.S. Curie made the connection with mortal world cartoons. “If you’ve ever studied mortal age cartoons, you’ll remember this one. A coyote was always plotting the demise of a smirking long-necked bird. The coyote never succeeded; instead, his plans always backfired. He would blow up, or get shot, or splat from a ridiculous height. And it was funny. Because no matter how deadly his failure, he was always back in the next scene, as if there were a revival center just beyond the edge of the animation cell. I’ve seen human foibles that have resulted in temporary maiming or momentary loss of life. People stumble into manholes, are hit by falling objects, or trip into the paths of speeding vehicles. And when it happens, people laugh, because no matter how gruesome the event, that person, just like the coyote, will be back in a day or two, as good as new, and no worse or wiser for the wear. -Immortality has turned us all into cartoons-.” After reading this it allows me to get an idea of how different and how truely cartoon like there life must be. Nothing can really go horribly wrong, and nobody ever really has to fear death in everyday life. The massive fear of nature is almost nonexistent, and it only partially remains because the Scythes uphold the higher calling of nature. i think that when she is saying that immortality has turned us all into cartoons she is really saying that we can jump off any building and semi-die and come back and laugh it off. In scythe so far Citra and Rowan have been brought to the scythe convention where all scythe gether like a school assembly with all the light and the amount of people by honorable scythe Faraday. While there they both failed the test they had to take and then the committee of scythe decide the only way to motivation Citra and Rawon have to gleam the one that doesn't become a scythe so then scythe Faraday decide to do the only thing to save the apprentice and he commit a self gleam so now the kids won't compete against one another and will be split up. Citra get to go with honorable scythe Curie who lives I and giant mansion on a waterfall which is weird since it would be so loud all the time but pretty cool. While Rawon goes with mass gleam that lives in a mansion the hes took from someone so that he wont be gleamed. In the book scythe the quote “She splayed herself, prostrate on the ground, her right cheek pressed against the pavement, which was searling hot from the midday sun. Her view was now of a dead man, just a foot away, whose eyes were empty, and yet staring into Citra’s at the same time. How could dead eyes still stare,” I could imagine in public her being yelled at and scared while crying over getting yelled at and embarrassed by Scythe Curie. Also the hot sun against your skin like a blacktop on a hot day at school recess. In “scythe” the part of the book that made me visualize what was going on the most is the plane massacre, which was a mass gleaning. It made me realize that not all scythes are good and some are corrupted and dishonorable. It also made me realise that some scythes are really messed up in the head and enjoy gleaning people which is a very bad thing. There was also a mass gleaning later in the book. During the scene i could almost hear the screams of the people dying. I like your visualization because it's almost the same one I had. For example, the scythes on the plane and the people screaming. It was possibly one of the easiest things to visualize. I really enjoyed reading that scene in the book. Neal Shusterman is a really good writer and he is good at helping the reader visualize. This scene of the book was very disturbing to me because of how careless the scythes were. They didn't even care that they were murdering those innocent people. This is a good thing to visualize i didnt even think about the mass gleanings. This brings up a very good point on how bad and corrupt the scythes can be. I agree with this example because it shows a very true fact. When you look at History, almost every time man is given the right to kill there are the honorable and those who find it enjoyable or soothing. Eventually someone will take it to far and the power they have been given will be abused. I agree because the book goes into such much details about the gleanings that if u close your eyes as their explaining the gleanings you can very well visualize the gleanings yourself. In the book "Scythe" there is two main characters, Citra and Rowan. They are both encountered by a scythe and they both act very differently to a scythe than most people. Citra is more demanding because while the scythe Faraday was at her house she yelled at him to find out who he was going to kill. On the other hand Rowan met the scythe at school when the scythe was going to glean a kid Rowan was there and requested to be with the boy that's going to be gleaned so he wouldn't be alone during his last moments of life. Those are the main characters in scythe. Scythe…. Scythe is placed in the perfect world/utopia where the thunderhead watches over everything with its AI. The question is the utopian lifestyle possible in our world today. I would have to say no, because everyone doesn't have the the perfect mind set and would most likely rebel against an AI as the leader of the whole world. Since in the book Scythe they have this thing called gleaning which is basically murder in this day and age which it probably always will be called keeps the population at a steady level. I think anyone in this world today would most likely disagree with that because it could take away kids,fathers,mothers, and any relations. This would most likely cause mayhem. As well this is like communism where there is one dictator that controls everything and the U.S has had many wars to fight against the communist governments.This is why I wouldn't think a utopian lifestyle would work. I have always had my concerns when it comes to having technology of any kind run my life in any way. However I am not blind to the obvious benefits and reasons that come with such a technologically advanced world. Things could be more precisely done and human error could almost if not fully be eradicated. However some of the most effective discoveries and biggest leaps in history have been made by mistake or during an accident. So if we remove the ability to do so then I wonder if we will almost fall behind rather than stay ahead even with the advanced technology. Besides all of that, I think it is impossible for the human race to have a true Utopia. No one is perfect and that can’t be changed by machines. Our bodies could be perfectly put back together, or minds could become more mechanised for greater precision. However when it comes down to it nothing can fix the true problem with humans. What lies within us is what makes it impossible to have a true Utopia. Some describe it as a soul and others think of it as their “being”. No matter what it truly is, it lies dormant and lets us think we have beat it, but as soon as we think we have conquered it and achieved perfection; it awakens. It takes over and makes us change everything we thought was so perfect and ruins our ability to retain anything that resembles a true Utopia. In the book scythe Rowan and Citra are living utopia, while in the real word the setting is dystopia, in our world we have crime, break ins, hoodlums, mob bosses, and murder and in scythe they have no real crime except things to do with the scythedom like sneaking a kiss of the ring or killing a scythe. I also think that the cloud is not a perfect world because everything has flaws including a computer mind AI thing. I do not believe upog exists just like i do no believe that uptopias exist because nothing is ever perfect, things may be pretty dang good but never perfect. Scythe is about how a world with an ai would be but if you read closely you see that it is not perfect it is no where near perfect because there is still people that are being hunted by the POPO or the FUZZ(the police). In scythe the mortality rate was like every teenager would die in a car crash but because of the technological advancments they no longer die. In the book “Scythe” they have made a perfect world where crime, disease, and even death has been conquered by the uses of a artificial intelligence all made possible by a organization named “Thunderhead”. They have made a utopia the perfect world but, would it really be possible for us to make utopia. I believe that a utopian word would be impossible maybe with intensive research we could become immortal but dealing with curing diseases, fighting wars, and other problems around the world plus the idea of finding immortality sounds a little far fetched that scientist don't evening want to waste their time on it. if we did conquer immortality we would still have to do something about the nukes or we would just end up floating in space for eternity. Then we would need the camera system the the “Thunderhead” witch would be difficult to install and very pricey and criminals would find a way around it so the camera system isn't very realistic. The camera system is just pretty much a waste. So in the end I do not see a utopia being possible at least using the methods given by the book. I do not believe that utopia’s are possible. There is no such thing as a “perfect world”. It is impossible to have a utopia . I do think our society could make artificial intelligience, but we could not make a perfect society, because there will always be corrupt people in politics. There will never be something like a “thunderhead”, because the people will be afraid of it. In our world we are runned by people, but in scythe people are runned by robots. In real life people fear artificial intelligence, but in scythe people use it as government and embrace it. In the real world people die of natural causes, but in the scythedom people die because of scythes. Scythes basically act as grim reapers. The scythes keep the population in check . In the scythedom there are no deaths from diseases, or accidents, and if there are the person that died can be revived. By reading the story this helps emphasize that point that utopias can’t exist. I agree with you because if it was possible to have a utopia, there would most likely be no more problems in the world which is nowhere near possible judging by the way it is right now. While I do agree that a world Utopia is impossible, Some of the things you mentioned in you blog don’t line up. The society in “Scythe” was scared to accept the existence of the Thunderhead, but it wasn’t to an overwhelming extent. I personally believe that we could make something such as the Thunderhead, and that society would be scared of it. However it’s not the fear of having the Thunderhead it’s the fact that humans simply can’t sustain anything “perfect”. We could make the technology to repair our bodies and fixate our minds, but we will never diminish our “soul” as some call it. It’s our soul that will never let us truly sustain a Utopia or anything perfect for that matter. utopia's simply are not possible they will always be something wrong with them it might be people are being gleaned or a bad people taking over there will always be that one thing that cant be fixed. There cant be a perfect world because no one is perfect it would be impossible to create a perfect world. People will always be corrupt and there will always be the bad people the crazy people. There could never be anything like a thunder head because no matter what a computer cant think the same as a human there will always be something missing from it it will lack the humanity that is needed to make right choices. also AI's can be hacked rewritten changed to comply with ones liking so it could never exist. Also people fear AI's because they could take over or change the world it could destroy everything. people fear change and uncertainties so it could never happen. I agree with your opinion on utopias. I too think that utopias will never be able to exist in a world no matter what the circumstances are. People will never be perfect and neither will artificial intelligence soo a society could never be perfect. I agree with you. There will never be a utopia, because there will always be corrupt people in the world with their own agendas and ideas. In real life you will see corruption in things like politics. In Scythe, their world is people living in utopia, while in our world, were living in dystopia. I don't believe utopia exists in reality because if utopia existed, we could choose violence to end and we could practically stop anything we would want to. Maybe in the next 20 years or so, we could have artificial intelligence instead of having other humans run our world. Thunderhead would be more than impossible to exist because it would make the world worse than it already is. the world in Scythe and our world have many differences. For one, people can die in scythe, but bring themselves back and in our world if we die, we die. But in Scythe, there is only one reason people die, and it's because of Scythe. This all pretty much explains why utopias can and will not ever exist. No utopias are not possible. A utopia will never exist. No matter what, there will always be racism, people will always judge each other, there will always be some sort of crime. You can make a city perfect will perfect rules but you will never be able to change peoples minds. In scythe, the scythedom tries to be a perfect society but even then it still fails to be perfect. For example the scythes try to kill only certain people, which would keep the population in check. But this brings imbalance and unfairness to the society. This book shows how a utopia cant exist without some sort of conflict or imbalance. Nothing can be perfect. I agree with this there is really no way to change how people think. People fear change because with change comes uncertainty plus no one likes change. i agree because some people have evil mindsets and you cant change that no matter what. No i dont think utopia is possible on earth.As long as theirs weapons,drugs,nuclear, and evil minded people on the earth there will never be peace.War disrupts the little bit of peace worldwide.If the government tried to make America an utopia they would have to take all weapons,drugs,and racism out of America. They would have to kill all criminals and evil minded people.Half the population wouldnt accept this change therefore rebellions and wars would breakout which would make things worst.